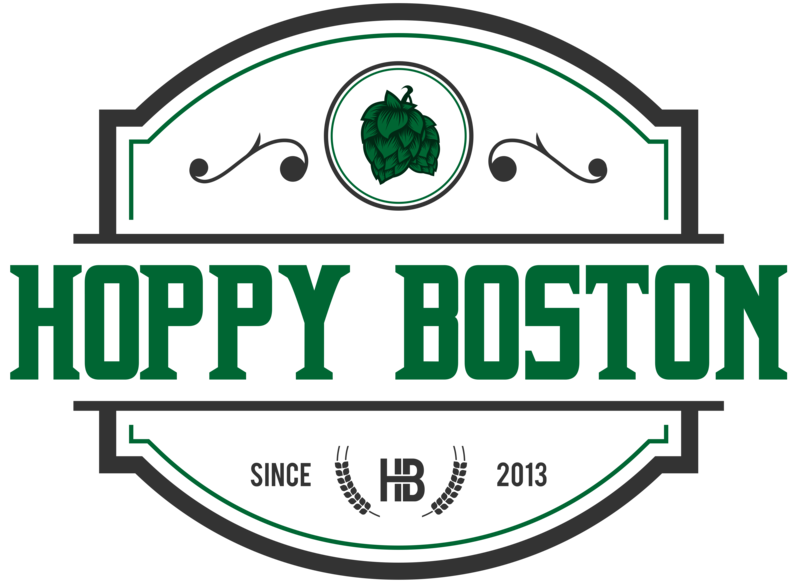 Boston based blog for all things craft beer, including reviews of beers and beer bars. Unlike many industries that focus entirely on competition, craft brewers love to collaborate. Most of the popular craft breweries have brewed collaboration beers, Sierra Nevada is even releasing a 12-pack with twelve different beers each brewed with a different brewery this Summer. In a seminal series of articles Bangor, ME based beer writer Chad Lothian had a group of Maine craft beer experts pick their dream collaborations involving Maine breweries. You can find the results HERE (and I highly recommend following his If My Coaster Could Talk blog, some of the best Maine-centric beer writing out there). It is no surprise that three of the breweries that made frequent appearances on these dream-team lists were Allagash, Rising Tide and Maine Beer Co. Both Rising Tide and Maine Beer Co. started in the “craft beer incubator” on Industrial Way next to the Allagash brewery, and while they have grown into new spaces there is still a strong sense of community amongst these old neighbors (for a write up of my visit to the current breweries on Industrial Way see: Part 1 and Part 2). Recently Allagash released Prince Tuesday, part of their Tribute Series, in collaboration with Maine Beer Co and Rising Tide. Prince Tuesday is a Belgian Rye Pale Ale brewed with rye malts from Rising Tide, hopped by the hop experts at Maine Beer Co. and then fermented using the Allagash house yeast. It is available on a limited basis in 750 mL bottles and on draft, with a percentage of the proceeds going to Portland Trails. 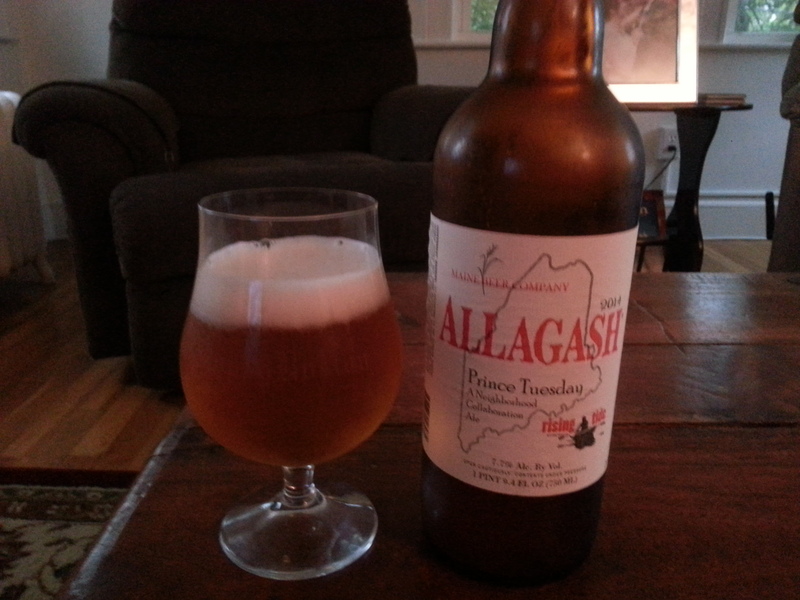 Allagash/Maine Beer Co/Rising Tide Prince Tuesday pours a deep gold, hazy with a massive white head. The smell starts with a huge burst of citrusy hops, followed by undertones of spicy and fruity esters from the Belgian yeast. The yeast comes through strongly in the flavor with touches of pear, bubblegum, clove and peppercorn. The hops are also present adding tastes of mango, grapefruit and guava. There is significant malt to balance the beer out, spicy rye and whole grain bread. Prince Tuesday is pretty easy to drink, the hops add a ton of flavor but pretty mild bitterness. The drinkability hides the alcohol well, you don’t taste any of the 8.1% ABV. The finish is complex with fruit, spice and just a hint of bitterness. This is a great beer, tons of different flavors but all of them are harmonious. I need to go find some more before it’s all gone. Hoppy Boston score: 4.75/5.